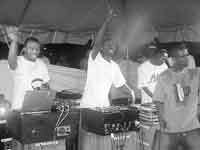 A two-year old DJ outfit known as âHypa Activeâ is now becoming the most talked about music fraternity in St. Vincent and the Grena-dines. SEARCHLIGHT sat down with the trio of Shane âDJ Shane the Wartankerâ Husbands, Oneil âDemolition Kidâ Sprott and Dennis âDJ Kofiâ Barker Jr. for a short chat last Tuesday. Mike man Shane, who hails from Sion Hill, is the brother of Raphael âDJ Taurusâ Husbands. The more outspoken of the three said, âI feel good and surprised coming up against big competition and winning.â He added that all the members of âHypa Activeâ are self-taught but are influenced by DJs like Sergeant Simmons and DJ Taurus. Enroute to the King of the Dancehall title, a song made popular by Jamaican entertainer and Grammy winner Moses âBeenie Manâ Davis, âHypa Activeâ called other DJ âBatty Manâ and told Grenadians Simply Smooth and Scratch Master that Hurricane Ivan blew them away and they had to live in a convertible. However, another DJ expressed dissatisfaction at this taunt which he saw as inappropriate. âThis was just all part of the clash,â said Shane as he described the reference to Ivan as, âjust a jokeâ. The DJ Clash was put on by Curve Entertain-ment, which is run by Davon âBasicsâ Cato and Jason âGalanaireâ Bess. Other DJs in the clash included Chaos Sounds, Kaution Sound, General Spoogy, Heavy Metal Sounds, Bad B and Chemical X.